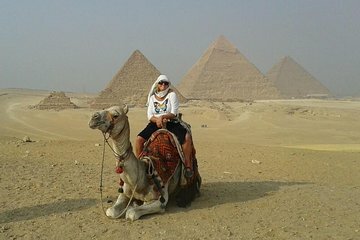 Tick off Egypt’s most famous pyramids on this half-day tour to Giza, which includes air-conditioned transfers in a comfortable coach (hotel pickup and drop-off included). You’ll also get a peek at the iconic, lion-bodied Sphinx and the history-packed Valley Temple. Best of all, you can top off your sightseeing with a thirty-minute camel ride through the desert—all amid a spectacular backdrop.